A long–time resident of West Philadelphia, Lucien Blackwell appealed to his primarily African–American, blue–collar constituents because of his image as a “common man.” The popular former city councilman successfully navigated Philadelphia’s Democratic Party machinery, emerging as one of the city’s most recognized politicians. Making his congressional debut in a special election to succeed powerful Representative William (Bill) Gray III, the former union president focused on helping working–class Americans who were suffering from the recession of the early 1990s. “The American worker is marching down the street asking for unemployment compensation because he has lost his job,” Blackwell said to his colleagues. “I ask every Congressman who does not vote for unemployment compensation tonight, give up your wages, give up your employment, give up what you’ve earned here, and then tell me it is all right to live off nothing.”1 However, Blackwell’s congressional career, marking a transitional phase in Philadelphia politics, proved to be short as the 73–year–old machine politician contended with a new generation of black leaders. Lucien Edward Blackwell was born on August 1, 1931, to Thomas and Mary Blackwell in Whiset, Pennsylvania. He had at least one sibling, a sister named Audrey.2 As a young child, Lucien Blackwell moved to a West Philadelphia neighborhood known as “the Bottom,” where his father opened a grocery store. He lived in that neighborhood all his life. Lucien Blackwell dropped out of West Philadelphia High School in 1947 to take a job as a dockworker on the Philadelphia waterfront. He briefly pursued a boxing career, winning a novice Diamond Belt Championship in 1949 before being drafted into the United States Army in 1953 to fight in the Korean War. During his military service, he was awarded a unit commendation, two bronze stars, and a good conduct medal.3 After returning to civilian life, he joined the International Longshoreman’s Union, serving aspresident of its Philadelphia branch from 1973 to 1991. Blackwell married and divorced at a young age. He met his second wife, Jannie, while she was teaching at a school attended by his sons, Lucien, Jr., and Thomas W. Blackwell IV.4 The couple married in 1972 and had four daughters:Patricia, Barbara, Brenda, and Audrey. Blackwell’s union work introduced him to politics. Living in a predominantly black, liberal neighborhood, he was a self–described Democrat “from the tip of my head to the bottom of my feet.”5 Blackwell first served in the Pennsylvania house of representatives from 1973 to 1975, but he made his mark as a Philadelphia city councilman, holding the office from 1975 to 1991. Blackwell earned the nickname “Lucien the Solution” for his attention to the needs of his constituents in West and South Philadelphia. He ran unsuccessfully for Philadelphia mayor as theConsumer Party candidate in 1979 against controversial incumbent Frank Rizzo, who was under investigation for fostering police brutality in Blackwell’s Ward. Both Rizzo and Blackwell lost to Democrat William J. Green. In 1986, Blackwell lost a bid for the Democratic city committee chairmanship to future Representative Robert A. Brady. 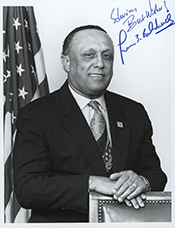 He nevertheless held key chairmanships of two Philadelphia political groups: the Black Elected Officials and the United Black Ward Leaders.In 1991, Blackwell made his second mayoral run, finishing second to eventual winner Edward Rendell in a hotly contested Democratic primary. Blackwell’s first taste of national politics came through his work on Jesse Jackson’s presidential campaigns in 1984 and 1988. In June 1991, Representative Bill Gray, the House Majority Whip and third–ranking Democrat, retired abruptly from his seat encompassing West Philadelphia, which boasted a black majority (82 percent) and a long Democratic voting record. Believing that the special election would take place on November 5—the same day Philadelphia voters would select a new mayor and a United States Senator—Blackwell declared his intention to run for the vacant seat and quickly became the front–runner. However, Gray postponed his resignation until September, citing the need to train the new House Majority Whip, Representative David Bonior of Michigan. According to Pennsylvania state law, special elections could take place no sooner than 60 days after a former Member resigned. Gray’s late departure pushed the special election back to early 1992, leaving Blackwell’s rivals a chance to organize their campaigns. Blackwell supporters accused Gray of thwarting their candidate’s chances, as the two had previously been political rivals.6 A federal court denied Blackwell’s request to return the election date to November 5; however, he subsequently appealed to the Pennsylvania state court, which ruled in his favor on October 1. During a whirlwind campaign the following month, Democratic ward leaders overwhelmingly supported Blackwell, as many district residents voted a straight Democratic ticket. Blackwell’s closest rivals included the young, charismatic state senator Chaka Fattah, a Democrat who was running as a Consumer Party candidate; and the former head of the Pennsylvania welfare department, John F. White, Jr., who was running as an Independent. Drawing upon the strength of the Democratic machine and his rapport as councilman with the city’s working class, Blackwell prevailed with 39 percent of the vote. Fattah and White each won 28 percent.7 Blackwell took his seat in the 102nd Congress (1991–1993) on November 13, 1991. 1Congressional Record, House, 102nd Cong., 1st sess. (2 June 1992): H4414. 2Blackwell paid tribute to his sister, Audrey Blackwell Farthing, in the Congressional Record. There is no mention of other siblings. See Congressional Record, Extension of Remarks, 103rd Cong., 1st sess. (15 June 1993): E1508. 3Congressional Directory, 103rd Cong., 1st sess. (Washington, DC: Government Printing Office, 1993): 250–251. 4The only information available about Blackwell’s first wife is that she was the mother of Lucien, Jr., and Thomas W. Blackwell IV. 5“Former ILA Local 1332 President, U.S. Congressman and Philadelphia City Councilman Lucien Blackwell Passes,” ILA Newsletter, Spring 2003, at http://ilaunion.org/news/nlp_spr03_page16.htm (accessed 13 September 2004). 6Politics in America, 1994 (Washington, DC: Congressional Quarterly Inc., 1993): 1293. 7Michael J. Dubin et al., U.S. Congressional Elections, 1788–1997 (Jefferson, NC: McFarland &amp; Company, Inc., Publishers, 1998): 774. 8“Election Statistics, 1920 to Present,” available at http://clerk.house.gov/member_info/electionInfo/index.aspx. 9Peter H. Spiegel, “Seniority Lineup in the 103rd,” 18 January 1993, Roll Call. 10Politics in America, 1994: 1292. 11James J. Kilpatrick, “Excise Pork From Federal Budget,” 25 April 1992, Chicago Sun–Times: 19. 12Congressional Record, House, 102nd Cong., 1st sess. (10 June 1992): H4511. 13Congressional Quarterly Almanac, 1995 (Washington, DC: Congressional Quarterly Inc., 1996): 7D–12D; Jennifer Babson, “Blackwell Summoned to White House for Clinton Talk,” 13 February 1993,State News Service. 14Congressional Record, House, 103rd Cong., 1st sess. (24 February 1993): H832. 15Nicole Weisensee, “Blackwell, Fattah Too Close to Call?” 29 April 1994, Philadelphia Daily News: 13. 16Ronald A. Taylor, “Power of Incumbency Wanes for Blacks Too,” 14 May 1994, Washington Times: A1; Richard Fenno, Going Home: Black Representatives and Their Constituents (Chicago: University of Chicago Press): 114–115, 124–125. 17“Lucien Blackwell,” Associated Press Candidate Biographies, 1994. 18Dave Davies, “Lucien Blackwell’s Back on Taxpayers’ Payroll,” 5 May 1995, Philadelphia Daily News: 5. 19“Blackwell Ends Run, Decides It’s ‘Time to Go’,” 2 February 1998, Roll Call. 20Dave Davies, “Farewell, Mr. Blackwell,” 25 January 2003, Philadelphia Daily News: 3. "Lucien Edward Blackwell" in Black Americans in Congress, 1870-2007. Prepared under the direction of the Committee on House Administration by the Office of History & Preservation, U. S. House of Representatives. Washington: Government Printing Office, 2008.